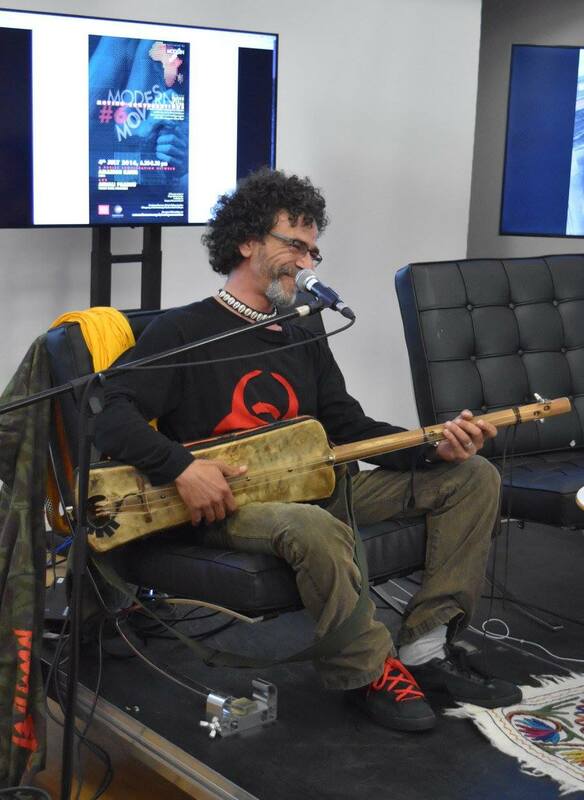 For the sixth in our Moving Conversations series on the 4th of July 2016 and the final event of this academic year, Modern Moves was thrilled to bring together musician Amazigh Kateb, founder of the legendary band Gnawa Diffusion, son of the great Algerian writer Kateb Yacine, and passionate spokesperson for postcoloniality and resistance through culture, and Anjali Prabhu, Professor of French and Director of the Newhouse Center for the Humanities, Wellesley College, USA, expert in Francophone postcoloniality, and author of, most recently, Contemporary Cinema of Africa and the Diaspora (2014). On the eve of Algeria’s Independence Day, we looked to North Africa and its musical relations with Sub-Saharan Africa and the Caribbean world. 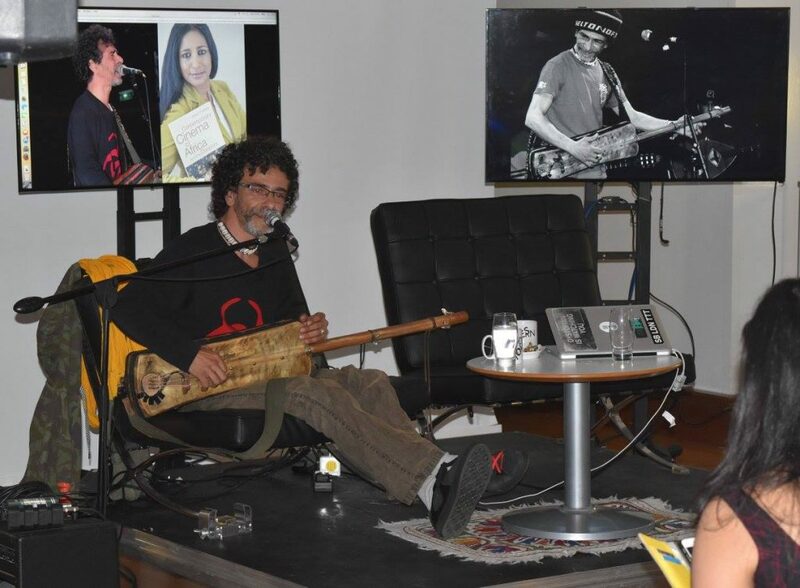 Amazigh Kateb opened the event with a song accompanied by the gnawa lute guembri after which Ananya Kabir introduced the guests to the audience. Anjali Prabhu told us having said to Amazigh when she met him that they had at least two things in common: “our love and admiration for his father Kateb Yacine” and “our belief as Africa as a unity, one entity that can provide and offer a reflection, and perhaps an alternative to our understanding of modernity”. After this statement she asked Amazigh to speak a bit about his music and the meaning of his music. He presented himself as follows: “I am a singer. I organise my artistic life and researches around gnawa music which is like North African gospel. It’s black music of North Africa and I began playing this music in exile, not in Algeria.” “This music was for me like a door open to my own culture” he added, explaining that as a child he was more interested in rock and other western music than in the local music he conceived of as old and archaic. He then recalled how he “discovered a part of [his] identity which is very African” when he went to the Algerian Sahara which culture is rather invisible in the northern part of the country. “I understood that the south, the culture of the south in Algeria was, for me, the best road to go inside myself” he said. This account of his artistic and musical journey to find his cultural identity while outside Algeria is further intertwined with a political vision. “We have a lot of histories, he said, but we have not our history. And our history is in Africa. For me we have to start to write a new history.” With such a statement, Amazigh Kateb let us appreciate how he places Africa at the core of his artistic engagement to play a role in the decolonisation of the ‘official’ Algerian history. Anjali incited him to elaborate further on his views on the question of aesthetics and the potential obstacles to reach his own goals. Amazigh compared the notion of world music as “a big trash bean” erasing the cultural specificities and social significance of music in any given context. He took the example of Malian Touareg band Tinariwen to illustrate his viewpoint: “Tinariwen is a band of resistance in Mali but in United States, in England, in France, in all the western countries, they are only exotic, they are only a band of Sahara, they drink mint tea and that’s it, it’s only sand and dunes.” Amazigh denounced here the exoticisation and commodification processes produced by the ‘world music’ labelling in a globalised capitalist market that challenge the notion of authenticity, a question that would regularly come back in the conversation. Then Anjali noticed that the written word and the spoken word are part of Amazigh’s aesthetics and asked him to explain his engagement with his father’s writing that interestingly first came through theatre and performance. Amazigh explained that his heritage was indeed double-sided: the figure of the father on the one hand and the one of the artist and writer on the other hand. He explained how the oral theatre performance was for his father a way to reach a wider audience in 1970 Algeria marked by high level of illiteracy. Taking over this legacy, the singer also feels the need to reach the “people who never went to school” as a very important matter and he tries to reach them through his music. Anjali noticed the same urgency among other African artists whom she worked with. By analysing how Amazigh’s music is both culturally situated and outward looking, Anjali asked the singer how this combination might challenge the notion of authenticity by acknowledging some contradictions inherent to the artistic creativity. These are complementary processes expounded Amazigh: “When you are alone and when you are in a self-reflection, you need the collective. But sometimes, when you are in the collective, you need to be alone to think by yourself. So we need the two aspects of the life.” Switching to French to further clarify his ideas applied to his music: “l’universel est toujours dans le particulier” he said, that is “the universal is always in the particular”. The dialectic relationship between the particular and the general is at the core of Amazigh’s work summarised Anjali, as well as a tension between the desire to be relevant in the present days to a given context and yet reach beyond. Amazigh stressed the social and political role of the artist and the potential power of music to reduce antagonisms within society. 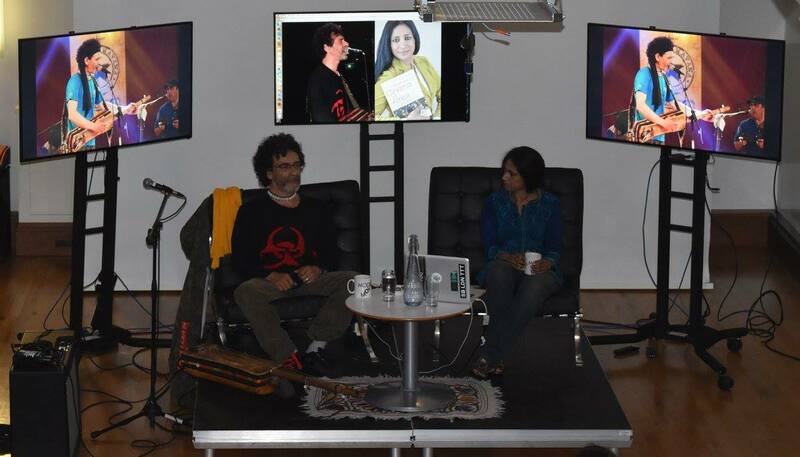 Anjali asked him to explain what his use of gnawa music and culture means for him. Not only gnawa music brought him back to his own identity he recalled, but he also started playing it when he was in exile in France in the beginning of the 1980s. He thus made a parallel between his own artistic trajectory and the fact that gnawa music has been created by the slaves brought from sub-Sahara to North Africa. The sense of “double exile” is then conveyed by both his own identity history and artistic trajectory as well as by the “gnawa spirit” that he wished to spread through his music. Therefore the name of his band Gnawa Diffusion was for him a way to “musicalize the exile” (“musicaliser l’exil”). He added that he also created his own “little Algeria” within his music as a means to keep the link with his home country while living in France and not returning to Algeria for at least ten years. He conceded though that his work does not address that much the religious aspects that are also part of gnawa music although this is through the lens of the religious practice that it mainly features in the representations. It is indeed particularly stressed as such within current festivals and other commodification processes. He is rather interested in the resistive voices and sounds conveyed by gnawa music. He also acknowledged that he is not a gnawi master specialised in the genre and therefore explained how he liked to mix some of its features and instruments with other kinds of music such as reggae for instance. It is for him a way to put some “relief”, some contrast to makes his music visible and different. As he put it “If you put me in Algeria, I am like invisible, you can see me but you don’t see me […] but if you put me in Sweden, you will see that I’m Algerian.” Yet again music and identity formation were linked in their reciprocal constructive and transformative capacities. The conversation then turned towards Amazigh’s new project called Argel de la Havana. This project arose from his encounter with a Cuban babalawo (orisha priest) in Havana in 2015 and their mutual discovery of the links between Afro-Cuban and gnawa music as well as their differences. He emphasised his intention to put side-by-side gnawa and Afro-Cuban music in order to explore their common African heritage as well as their “latino/Mediterranean” aspects as in Algerian chaabi for instance. He also recalled how much he conceived of Cuba as the “island of resistance”, therefore confronting two very different post-revolutionary histories. 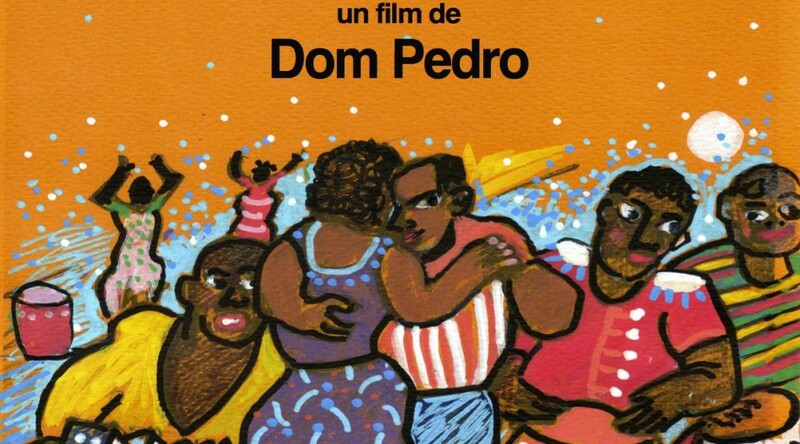 Through this musical exploration, he also wants to draw on the political context that linked Cuba to Africa in the frame of the Non-Aligned movement and the Tricontinental ideology in the Cold War era. This political background amplifies thus his feeling to be closer to a Cuban than to a Qatari for instance. He feels the need to fight against the media invasion and the militaro-financial dominance of Saudi Arabia and Qatar in the continent through his music in order to find an alternative to the conception of the world on a religious bias. Through his project, he would like to bypass the current Manichean way of seeing the world as muslim and non-muslim and to this extent, “I trust the music to speak about it” he said. To conclude the conversation and illustrate his new project, Amazigh performed a song called “Congo Managua”, a song that he learnt in Cuba and enjoyed for he felt it very close to gnawa music. The audience had questions about the mixing of Cuban clave rhythm with gnawa music and about the overall concept of the project Argel de la Havana; about the sanitation of aesthetics versus the question of authenticity to which Amazigh explained the need to conciliate heritage and present creativity without erasing dust and grime; about the reception of his music; and about the anti-capitalist potential of improvisation! 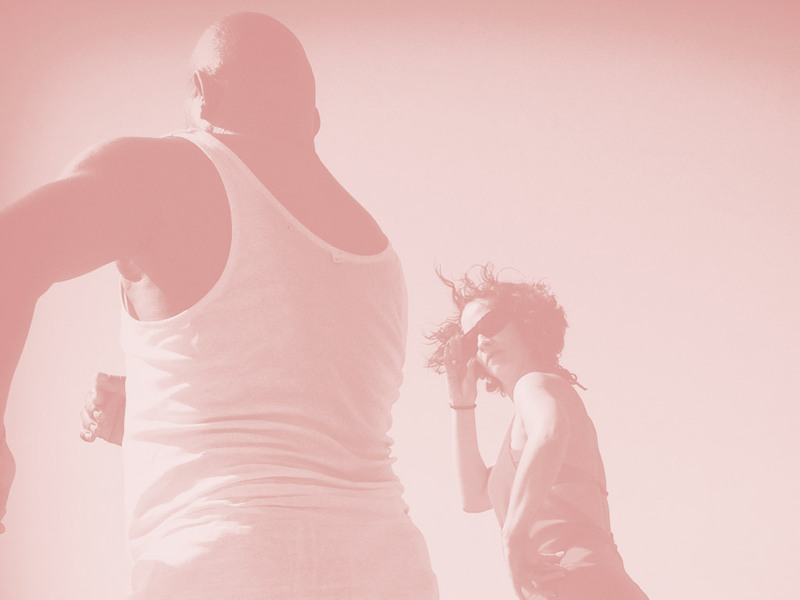 The depth of the sixth Moving Conversation asserted the power of music as a tool for resistance and as a site for political utopia able to overcome colonisation and capitalism. Amazigh’s will to use music politically while denouncing the use of music by politics was then celebrated with mint julep cocktails and North African mezze-type inspired canapés. 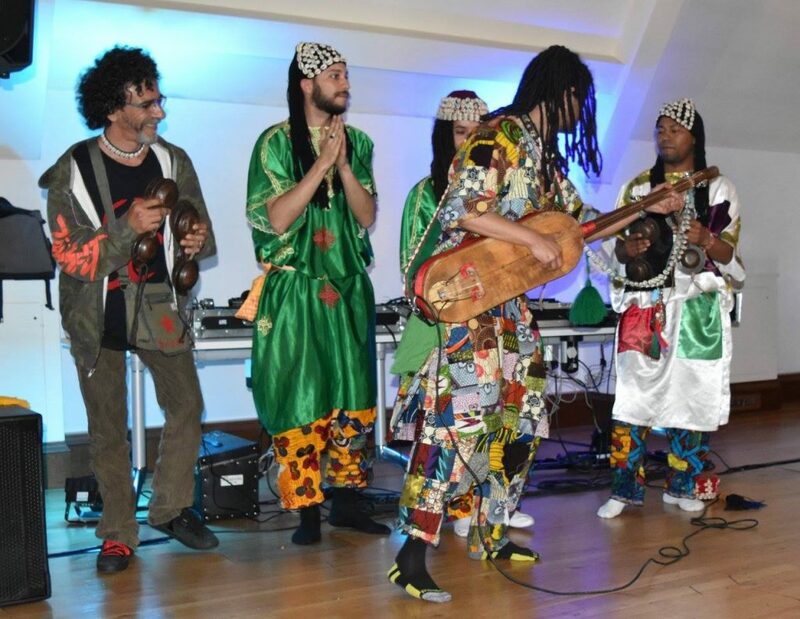 The Anatomy Museum vibrated to the performance of gnawa music by London-based artist Simo Lagnawi and his band to which Amazigh joined in, danced and played the qraqeb. A DJ set offered by John Armstrong culminated the event that coincidentally happened at the end of the month of Ramadan marked by terrorist attacks all over the world including in the Muslim world, stressing the relevance of the thoughtful reflections unfolded during the conversation.